South Korea's central bank on Thursday froze its key rate for July as the economy shows some signs of a slowdown and inflationary pressure remains low. The monetary policy board of the Bank of Korea voted to keep the critical rate unchanged at 1.5 percent as widely expected, extending its wait-and-see stance to eight months. In November last year, South Korea's central bank adjusted up the key rate for the first time in more than six years, citing economic recovery. Gov. Lee said the July decision was not unanimous as Lee Il-houng, part of the seven-member board, voted for a 0.25 percentage point increase. Disappointing economic data seems to have nudged the BOK to make its latest decision although many analysts had earlier expected a rate hike in July. The central bank said it will downgrade its earlier growth forecast of 3 percent for 2018 and maintain an expansionary monetary policy for a while. "Going forward the board expects domestic economic growth to be slightly below the path projected in April but to sustain a rate at its potential level," the BOK said in a release. "As it is forecast that inflationary pressures on the demand side will not be high for the time being, while the domestic economy is expected to continue its solid growth, the board will maintain its accommodative monetary policy stance," it added. The country's employment remains sluggish despite trillions of won worth of extra government spending to ease the tightened job market. The monthly number of newly created job positions stood at around 100,000 for the third straight month in June, marking one of the lowest readings since the 2008 global financial crisis. The number of new jobs in the backbone manufacturing sector declined amid restructuring in the labor intensive shipping and automaking industries and overall changes to industrial structure. Earlier, the central bank lowered its estimates for job creation to 260,000 from a previous projection of 300,000. At the same time, household debt is on a steady rise and reached a record 1,468 trillion won (US$1.36 trillion) in the first quarter of this year. A rate hike may place a heavier burden on borrowers. Consumer price inflation has been hovering around 1.5 percent for months, far lower than the BOK's target of 2 percent. Also, uncertainties are building around the world due to the possibility of a trade war between the United States and China. The world's two largest economies are South Korea's No. 1 and No. 2 trade partners. "In the beginning, many thought that the US-China trade row would not escalate, but now, it is spreading rapidly and heightening uncertainties in the global economy," Gov. Lee said. "It is hard to predict the future. But we are well aware that the clash between the two powerhouses will affect the South Korean economy and its exports." Some watchers said the BOK won't likely raise the base rate by the end of the year, changing from its earlier plan to increase the rate once or twice in 2018. The central bank was expected to adjust the monetary policy in the second half in a way to keep up with the US Fed's rate hike schedule for 2018. Following the Fed's latest increase in June, South Korea's base rate stands at 1.5 percent, compared with the US range of 1.75-2 percent. The widened rate spread may spark an outflow of foreign investment in South Korea. "Uncertainty and volatility in the global financial market have risen highly and can affect the South Korean financial market as well," said Lee. "Against this backdrop, the rate difference between Korea and the US may accelerate the foreign outflux. We are watching it, but we have strong economic fundamentals that should allow foreign investors to stay put." 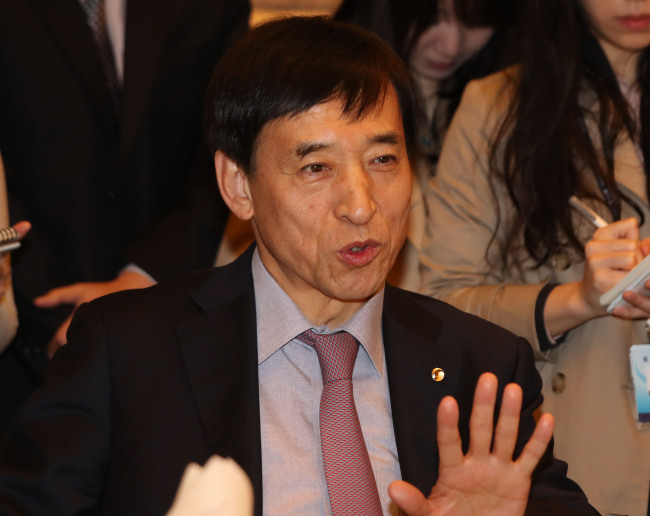 Seoul's central bank wants to have a higher key rate in a bid to secure wider policy space to better deal with a possible economic downturn in the future.